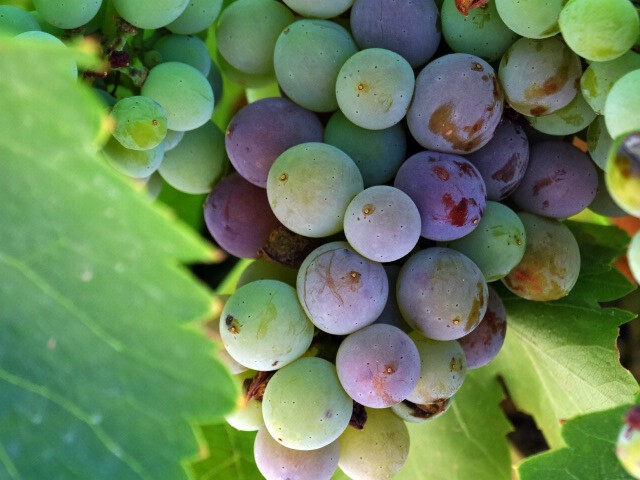 When the grape starts its maturation and the color changes from green to yellow or from green to blue/black/purple, this is known as “veraison”. Varaison is a magic stage of the maturation cycle. Grapes stop growing, they lose clorofile and the start to change their colour. Poliphenols are in charge of this particular colour depending on each grape varietal. Watching this process in the vineyards, it is a wonderful sight. In the northern hemisphere, it is in July when veraison takes place. Thanks to the heat, gapes start getting their characteristic colours. The dates of this process announce or predict the optimum dates for the harvest around 35-55 days later. During these days, grapes accumulate several components as sugar, acid and other elements which are responsible of colour, taste and structure of the wines. The skin not only changes the colour but also it becomes thinner and softer. At the same time, branches become harder and get and brown- grey colour. Not long ago, tasting of grapes in the vineyards was the usual method for farmers to decide the date for the harvest. Nowadays, there are stricter and more sophisticated methods to control this parameter that helps determine the health status and the optimal state of maturation. In several cities, the end of the maturation cycle is celebrated with a party. One of the most famous is celebrated in Chateauneuf- du – Pape in France during the first week of August.